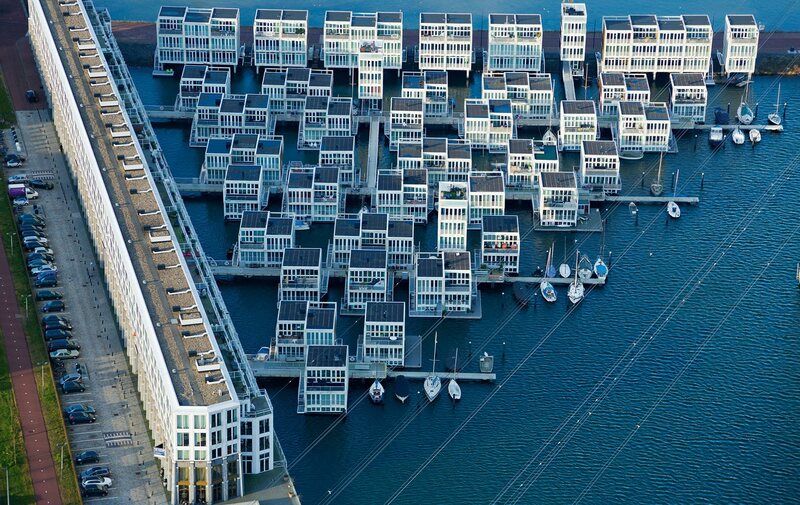 The Netherlands and water are an inseparable combination. In a corner of the European continent, water is everywhere, around and within. Besides its long North Sea coast line, the country is basically a large river delta. Belgium’s largest rivers, the Scheldt and the Meuse, do not reach the sea in its own territory. They go on to the Netherlands, and reach the North Sea there. Same for the Rhine, once one of the northern border rivers of the Roman Empire. The Netherlands is the place where the water goes. A lot of the country used to be a swamp area. Its name, Netherlands, literally means low lands. With 26 percent of its land below sea level and 60 percent of the land vulnerable to flooding , an appropriate name . Its stereotypical windmills are not just a pretty sight. They were used to pump out the water, and create land for farming and living. The Dutch have been fighting the water for a thousand years. Water is what makes the country what it is. The Dutch are quite effective in managing their water situation. They learned through experience. In 1953, a devastating storm hit. They call it the Water Disaster. Hitting the southwest of the country and the province of Zeeland, literally mean Sea-land, many dikes broke. Over 1,800 people died, in one night. The Dutch decided to lock out the water. Because if the disaster was able to happen due to the dikes being weak and old, what would be the first response? Make bigger, higher, stronger dikes. They called it the Delta Works. Instead of heightening over a thousand kilometres of dikes, they dammed the mouths of major rivers. Except not all river mouths can simply be closed shut. Some were left open, so ships could reach the massive harbours of Rotterdam and Antwerp. Nor does the water always come from the sea. It comes from the rivers, or the sky. While the Dutch learned from 1953, more lessons were still to come. Because of the unwillingness to demolish houses in flood prone areas, new water disasters in the 90s caused large economic damage, and hundreds of farm animals died. If keeping the water out does not always work, how about letting it in? Living with the water rather than battling it. Being safe from the water by letting it in. A counter-intuitive and at first strange approach to many Dutch who know their history of dikes and water well. Reminiscent of the children’s book “Niemand Houdt Mij Tegen”, taking place in a future where Amsterdam is flooded and Rotterdam surrounded by huge walls keeping out the water, building larger and larger dikes is not a solution. Unless you want to build 10 meter high walls along the entire coast line and at every river bank, other solutions will have to do. A solution called controlled flooding. The concept is simple: if places will flood anyway due to storms or sudden rises of the rivers, the Dutch would rather have farm land and parks flood, than city centres and neighbourhoods. The new project, called Room for the River, does not take land from the water. It gives the water space. Yet in a land as densely populated as the Netherlands, all the land belongs to someone – and when the government decides your land will be re-purposed as an area to be flooded, the predictable outcome are uprooted farmers. Yet the benefits are clear. In a country where 60 percent of the GDP is produced below sea level, defence against water is a priority. One example is the Overdiepse Polder. The area, farmland by the Bergse Maas canal, lays lower than the canal and was surrounded by dikes. By lowering the dike just a bit, the area would be flooded when heavy storms occur, and by such lowering the water level of the canal – leaving the upstream city safe from flooding. By sacrificing the farmland, the city is safe. Yet of course the farmers were not cheering. They were however given no choice. The government decided this was what is going to happen, and that was final. A politically difficult decision, especially if the results are not immediately visible. Yet, the Dutch have a responsibility to make these difficult choices. So they do not once again have to learn their lessons the hard way. After negotiations with the farmers, through dialogue and honesty, they understood they could not stay – yet they made a compromise. All farms were demolished, half of them left, and half stayed. Their new farm is now on a man-made hill. Their farmland, available for use, and likely to flood once every 25 years. With half of the population, 8 million people, living below sea level, water is a constant thought for the Netherlands. With too many disasters in the past that could have been prevented if it were for some political courage and foresight, the Dutch do not want to make the same mistakes again. The process of coping with water is everlasting. At least if the Dutch want to continue living in their country, the evolution must never end.